As the nights linger on and the brisk chill settles deeper into our days, love in all facets flourishes to bring about the most romantic time of the year. Reformation dress. For Love & Lemons sweater. Soukie Modern clutch. Chloé Eau de Parfum. The wintry spirit enthusiastically brings people closer together in friendship, kin, and love and Kyle and I have a busy schedule this season, making time to visit our families more often and gathering our friends together for warm mulled wine and good times. We recently got engaged (more on that soon!) and we also can’t go a few days without hearing an exciting engagement announcement, one after another, amongst our friends. Romance is clearly in the air and I’m a sucker for it. Cushy knits and ethereal dresses, dark foliage and starry blooms of white magnolias define my essence of a wintry romance. But romance also begins with a sweet memory triggered by a single scent and it was something I experienced with Chloé Eau de Parfum. The fresh, feminine scent of magnolias and roses took me back to the luscious gardens in Paris, where Kyle flew halfway around the world to surprise me on my travels apart. Our first time in Paris together was unforgettable, where each day was a chapter of an elegant, yet whimsical love story. I still find myself amazed at the innate relationship between scent and memory, an incredible phenomenon that is so romantic in its nature. It’s the reason why I’m addicted to floral scents, as florals have always been a part of my life, from my mom’s weekly lilies and the jasmine that grew underneath my window. 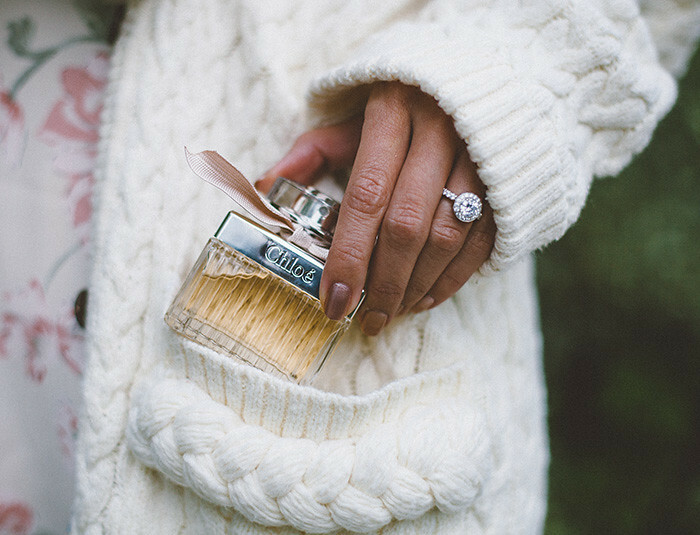 Chloé’s signature fragrance is a treasured accessory of memories past and I know it will play its part in a fairytale future. Your outfit definitely makes me think of Chloe :) Love this!